光玥 WaferPlus 為專業特種材料供應商, 提供半導體, MEMS, LED, 光電光學, 太陽能, 顯示器產業, 微流道反應器, 生物科學, 可根據客戶加工需求提供創新的解決方案. 提供玻璃晶圓, 玻璃與矽鍵合的晶圓, 與石英晶圓的精密加工. 尺寸由2吋 (Dia. 50mm) 到12吋 (dia. 300 mm), 或是客制化的特殊尺寸. 熔融石英 (Fused Silica), 熔凝石英 (Fused Quartz), 紅外線石英 (Low OH)..
ü 直徑: Dia. 100, 150, 200, 與 300 mm. ü Roun圓形, 方形, 異形, 3D-IC的TSV & TGV interposer, Carrier wafer, GOS (Glass on Silicon), SOG (Silicon on Glass), QOS (Quartz on Silicon), SOQ (Silicon on Quartz), Prime & Test grade Silicon wafer, SOI wafer 等客制化解決方案. ü 按照SEMI Standard 或是JEITA 加工. ü 厚度: 50µm 到 3000µm. ü TTV: < 3 µm. ü 表面粗糙度 (Ra):< 0.5 nm (MDF) 或 < 1.5nm (Standard). ü 拋光等級: 雙面拋光, 單面拋光, 雙面霧化, 單面霧化. ü 孔徑: 最小 30 µm (0.03mm). ü 凹槽: 最小 10 µm (0.01mm). ü 切溝: 最小 10 µm (0.01mm). ü 加工技術: 噴砂, 超音波, CNC鑽孔, 濕法蝕刻, 模造, 雷射等方式來加工客制化的腔體, 刻溝, 盲孔, 與穿孔. ü 鍍膜: NWIR, LWIR, UV, AR, Cr, Au, Ag, Ti, Cu, Al, Sn等鍍膜可滿足特殊光學需求, 寬頻或是窄頻narrow band 都可以按客制化需求來生產. ü Low Defect 雙面AR鍍膜穿透率 > 99%. ü 化學強化玻璃, 無堿玻璃, 陶瓷, 藍寶石, 氮化鋁, 石英等透明硬脆材料. ü 雷射直接鍵和硼矽酸玻璃, 無堿玻璃, 透明陶瓷, 藍寶石, 石英等同種透明硬脆材料. ü 直接在材料交界中間燒結, 不需使用膠材, 玻璃粉, 或金屬. ü 晶圓尺寸 4吋, 6吋, 8吋, 與12吋. ü 可應用於半導體(SEMI)與微機電 (MEMS) 3D interposer 制程. ü 可先製作通孔, 表面鍍金或填充各種導電金屬, 的TGV wafer, 然後與矽晶圓鍵和. ü 常用型號3535, 5050, 5060, 7070, 9090等都有公模. ü 可提供中片如102x54mm, dicing, 切割, 與擴片. ü 雙面 UVAR 鍍膜 @ 260nm~300nm > 97%. ü 應用產業 : 航太, 汽車, 消費類電子產品, 顯示器, 玻璃, 機械工業,光學光電, 光伏, 半導體封裝, 智慧卡 RFID, 以及更多的創新產品應用. ü 使用強化玻璃, D263, 藍寶石, 石英等材料. ü 使用玻璃, 石英, 矽等多種材料製成的微流量元件可用於製造實驗室晶片與微反應器, 使用於化學和醫療等微混合產業, 有多層設計的緊密結構, 可提供標準微流道晶片或按照客戶需求客制化生產. 光玥 WaferPlus 为专业特种材料供货商, 提供半导体, MEMS, LED, 光电光学, 太阳能, 显示器产业, 微流道反应器, 生物科学, 可根据客户加工需求提供创新的解决方案. 提供玻璃晶圆, 玻璃与硅键合的晶圆, 与石英晶圆的精密加工. 尺寸由2吋 (Dia. 50mm) 到12吋 (dia. 300 mm), 或是客制化的特殊尺寸. 熔融石英 (Fused Silica), 熔凝石英 (Fused Quartz), 红外线石英 (Low OH)..
ü 直径: Dia. 100, 150, 200, 与 300 mm. ü Roun圆形, 方形, 异形, 3D-IC的TSV & TGV interposer, Carrier wafer, GOS (Glass on Silicon), SOG (Silicon on Glass), QOS (Quartz on Silicon), SOQ (Silicon on Quartz), Prime & Test grade Silicon wafer, SOI wafer 等客制化解决方案. ü 抛光等级: 双面抛光, 单面抛光, 双面雾化, 单面雾化. ü 孔径: 最小 30 µm (0.03mm). ü 切沟: 最小 10 µm (0.01mm). ü 加工技术: 喷砂, 超音波, CNC钻孔, 湿法蚀刻, 模造, 雷射等方式来加工客制化的腔体, 刻沟, 盲孔, 与穿孔. ü 镀膜: NWIR, LWIR, UV, AR, Cr, Au, Ag, Ti, Cu, Al, Sn等镀膜可满足特殊光学需求, 宽带或是窄频narrow band 都可以按客制化需求来生产. ü Low Defect 双面AR镀膜穿透率 > 99%. ü 化学强化玻璃, 无碱玻璃, 陶瓷, 蓝宝石, 氮化铝, 石英等透明硬脆材料. ü 雷射直接键和硼硅酸玻璃, 无碱玻璃, 透明陶瓷, 蓝宝石, 石英等同种透明硬脆材料. ü 直接在材料交界中间烧结, 不需使用胶材, 玻璃粉, 或金属. ü 晶圆尺寸 4吋, 6吋, 8吋, 与12吋. ü 可应用于半导体(SEMI)与微机电 (MEMS) 3D interposer 制程. ü 可先制作通孔, 表面镀金或填充各种导电金属, 的TGV wafer, 然后与硅晶圆键和. ü 常用型号3535, 5050, 5060, 7070, 9090等都有公模. ü 可提供中片如102x54mm, dicing, 切割, 与扩片. ü 双面 UVAR 镀膜 @ 260nm~300nm > 97%. ü 应用产业 : 航天, 汽车, 消费类电子产品, 显示器, 玻璃, 机械工业,光学光电, 光伏, 半导体封装, 智能卡 RFID, 以及更多的创新产品应用. ü 使用强化玻璃, D263, 蓝宝石, 石英等材料. ü 使用玻璃, 石英, 硅等多种材料制成的微流量组件可用于制造实验室芯片与微反应器, 使用于化学和医疗等微混合产业, 有多层设计的紧密结构, 可提供标准微流道芯片或按照客户需求客制化生产. WaferPlus is the professional material supplier, which provides customized solutions with innovations for Semiconductor, MEMS, LED, Opto-electronics, Solar, Microfluidic, Biotechnology, and Display applications. Fused Silica, Fused Quartz, Low OH Quartz. Electronic grade for 3C product, White glass B270. ü Applicable to 3D-IC TSV & TGV interposer, Carrier wafer for IGBT, MEMS GOS (Glass on Silicon), SOG (Silicon on Glass), QOS (Quartz on Silicon), SOQ (Silicon on Quartz), SOS (Sapphire on Silicon), customized SOI wafer. ü Wafer Diameter : 50, 100, 150, 200, 300mm. ü Round, Square, and Customzied shape. ü Notch and Flat based on SEMI or JEITA Standard. ü Thickness : 50µm ~ 3000µm. ü TTV < 3 µm. ü Roughness (Ra) < 0.5 nm (5A). ü Surface treatment: Polished or Frosted. ü Micro-structuring on wafers and substrates with holes and cavities. ü Hole diameter: Dia. 30 µm (0.03mm). ü Cavity depth: 5 µm (0.005mm) with Clear or Frosted bottom. 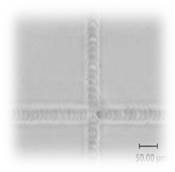 ü Groove: 10 µm (0.01mm). ü Processing by Sandblasting, Ultrasonic drilling, CNC, Wet etching, Molding, and Laser to produce customzied design including cavity, groove, through hole, blind hole. ü UVAR for UVA and UVC LED @ 260nm ~ 300nm. ü UVIR-cut with Low Defect Coating for CIS @ 650nm, for Ambient light sensor @ 550nm and 670nm. ü Motion Defect IR coating @ 850nm. ü IRAR for NightVision @ 2~12um. ü DAR >99.5% for Automotive Lighting & DLP @ VIS. ü IR-cut, UV-cut, Cr & Patterning for WL Optics & WL Packaging, LCOS, DLP. ü Metal Coating: Au, Ag, Ti, Cu, Al, Sn. ü Narrow band and Customized spectrum upon request. ü Applicable to clear crystal material, including Chemical toughened glass, Borosilicate glass, Alkaline-free glass, Sodalime glass, Silicon wafer, Sapphire (Al2O3), Ceramic, ALN, etc. ü Feasible for cutting Compound materials (eg. Glass + ALN). ü Cutting for extra-thin glass from thickness 50um. ü Through hole, blind hole, Grooving, Pre-cut, Alignment mark, tracking number. ü Straight cut edge (90°) with chipping < 10um. ü Cutting width 10um and increase the material usage. ü Low contamination cutting with high cleanliness. ü Laser weilding for transparent crystal materails, including Borosilicate glass, Alkaline-free glass, Ceramic, Sapphire, Quartz, Silicon, etc. ü High laser weilding speed @ 1500mm/s. ü Direct weilding between two transparent materials without glue, glass frit, glass paste, or metal. ü High vacuum sealing against critical environment such as high temperature and high pressure. ü Weilding width is about 30~50um. ü Low thermal influence in the welding path, keep the device safe from thermal shock. ü Straight or Curve Vacuum sucking pen for 4“, 6“, 8“, and 12“ wafers with thermal resistance, alkali and acid resistance. ü Wafer Finder, Wafer Transfer, Wafer Reader. ü Vacuum pump, tubing, pen station. ü PFA, Metal, and PP cassette. ü 2“ ~ 8“ Shipping Box, Cassette box, and 12“ FOSB box (vertical). ü 4“ ~ 12“ Wafer box with cushion and cleanroom interleaves (horizonal). ü Glass and Quartz as raw material. ü Production by Molding, Etching, and Bonding. ü Packaging cap for UVA, UVC, UHB LEDs used in Automotive, Projection, Stage lighting, IR sensing, OLED lighting, OLED Display etc. ü 3535, 5050, 5060, 7070, 9090 avalable on stock. ü Wet etching depth down to 700um. ü Bonding solution with UV cure Glue or Au coating for Eutectic Bonding. ü Delivery in Substrate, Array, and Cap size by Dicing. ü Double side UVAR coating @ 260nm~300nm > 97%. ü Tooling glass substrate for phosphor deposition in the LED flip-chip process. ü Size available for Round and Square, such as 4“ x 4“, 5“ x 5“, 6“ x 6“, 8“ x 8“. DOL > 40um, CS > 650 Mpa. ü Recycle with long lifetime. ü Extra-thin glass 50um, 100um, and 200um as substrate for phorphor deposition with glue ahdesion. ü Round and Square size 100mm, 150mm, and 200mm. ü High strength with low edge chipping treatment. ü Glass with High transimttance > 92%. ü Phorphor glass is bonding with UHB LED flipchip for brightness enhancement. ü Specialized for industrial applications. ü Customized glue recipe applicable to LED, SEMI packaging, Optics, Solar, Electornics, Automotive, Biotechnology, Microfluidic device, SIM card, RFID, Glass, Plastic, Metal bonding, etc. ü Standard and Customerized glue composition based on customer‘s requirements. ü Wafer size @ 4”, 6”, 8“, and 12“. ü Thin glass 100um with fine hole drilling Dia. 30um. ü Low-resistance metal dopped in the via or coating with lift-off. ü Low to High CTE glass wafer available for TGV. ü TSV insulation trench with Al2O3 or SiO2 barrier coating for Si or Cu vias. ü Applicable to SEMI and MEMS 3D IC interposer. 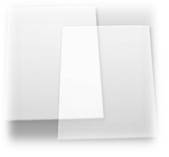 ü Frosted surface with wet etching for Displays in the Automotive, LCD Monitor, Mobile phone, Pad, Touch Panel, Industrial & Medical control panel, Public and Educational panels, etc. ü Wet etching to create micro-structure on glass surface, with everlasting quality and No peeling. ü Gloss Range 12~120 GU. ü Transmittance 35% ~ 91.5%. ü Chemical or Thermal toughening are both OK for AG glass. ü Material: Sodalime, Gorilla, Dragontrail, BF33, etc. ü Material: Sapphire, D263, Gorilla, ZrO2, etc. ü Thickness from 100um ~ 200um. ü Oval shape or square shape cutting. ü Wet etched cavity with 300um depth on mobile phone panel, hiding under the home bottom location, which enlarges the display area. ü Optical coating or printing upon with black or white. ü Hydrophilic or hydrophobic coating. ü Borosilicate Glass, Quartz, Silicon, with micro-structuring and bonding as device. ü Applicable to Chemistry, Pharmacy, Biotechnology, Healthcare, Ecology, Medical, Cosmetics products, etc. 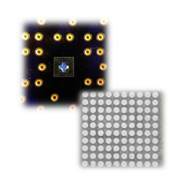 ü Standard or Customized microfluidic chip with single or multi-layers. ü Glass and quartz with various fluorescence level upon request. SOI(シリコン-オン-インシュレーター)ウェハ、CZ & FZ、P&N type、100 & 111 低&高抵抗、プライム&テストグレード. ü 3D-IC TSV&TGVインタポーザの方に応用、IGBT用キャリアウェハ、MEMS GOS(ガラスオンシリコン)、SOG(シリコンオンガラス)、QOS (クオーツオンシリコン)、SOQ (シリコンオンクオーツ) SOS (サファイアオンシリコン)、カスタマイズSOI ウェハ. ü ウェハ直径 : 50, 100, 150, 200, 300mm. ü 厚み : 50µm ~ 3000µm. ü 粗さ(Ra) < 0.5 nm (5A). ü ホール直径: Dia. 30 µm (0.03mm). ü キャビティ深み: 5 µm (0.005mm)、クリアかフロスト ボタン. ü UVAとUVC LED向けUVAR @ 260nm ~ 300nm. ü CIS @ 650nm用途、周辺照明センサー@ 550nmと 670nm用途、ロー欠陥コーティングUVIR-cut. ü IR スペクトル @ 850nmを動態探知. ü 車載照明DAR >99.5% & DLP @ VIS. ü IR-cut、UV-cut、クロム、及びパターニングは、WL 光学モジュール、WLパッケージング, LCOS, DLPに応用. ü メタルコーティング：Au, Ag, Ti, Cu, Al, Sn. ü チッピング< 10um直行カット縁 (90°) . ü 4“, 6“, 8“ 及び12“ウェハの直行かカーブ真空吸引ペン、熱抵抗、アルカリと酸性抵抗. ü 2“ ~ 8“ シッピングボックス、カセットボックス、及び12“ FOSBボックス(立). ü 4“ ~ 12“ ウェハボックス、クッションとクリーンルームインターリーブ (横). 4“ x 4“, 5“ x 5“, 6“ x 6“, 8“ x 8“. ü 強化後に高強度DOL > 40um, CS > 650 Mpa. ü ウェハーサイズ @ 4”, 6”, 8“, また 12“. ü 伝導性 35% ~ 91.5%.